HongJi Noodle House is the first ramen noodle that I tried in Chengdu, the capitol of Shechuan province famous for numbingly spicy food. 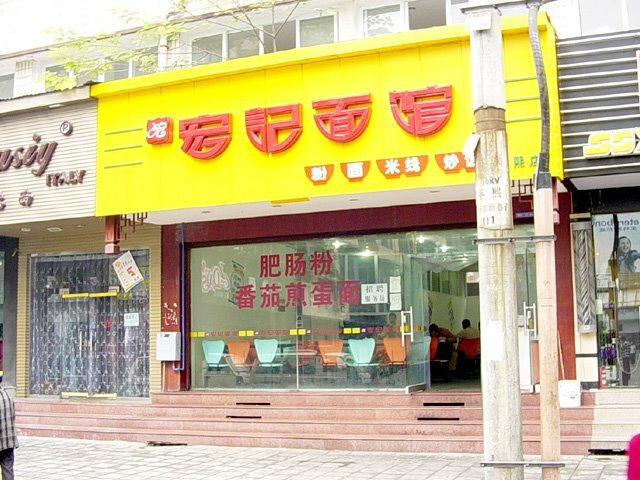 I did some research on the internet and tracked down this noodle house in the busy shopping district of Chengdu's ChunXi Street. I came here for Dan-dan noodles but was surprised to find out they didn't have the item on their menu. Instead I asked about this 甜水面 (tian sui mian) or "sweet water noodles" on their menu, I asked the store if this was a dessert item, they said "no". I asked what's in it, they replied "just order it and you'll find out". So I gave it a try. The Sauce - There is no soup, just a thick oily chili sauce that is mixed with 五香粉 five flavored spice, 花椒粉 Sichuan pepper, and quite a bit of sugar. The chili sauce has a lot of flavor to it, probably made from stewed pork. 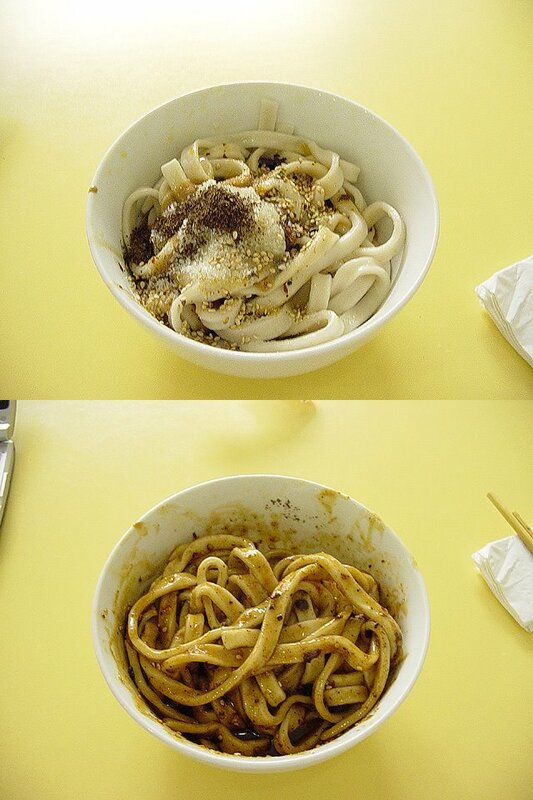 The noodles become dark brown after mixing all the ingredients together with all the bits and pieces of the powder clearly visible on the noodles. The Noodles - are thick straight, almost udon like noodles cooked on the firm side. 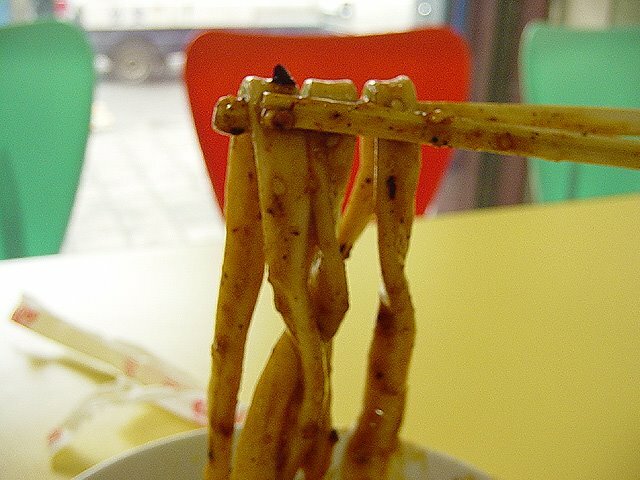 The noodles are very chewy, forcing your mouth to deal with all the hot spices swallowing it. The Toppings - are just the spices, no toppings. Overall - what an experience! 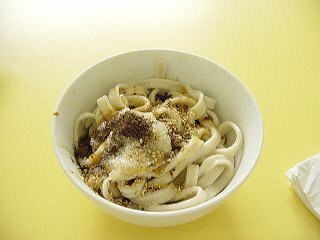 The chili powder's heat counters the cooling sensation of Sichuan pepper. At first the sweetness of the noodles are quite strong, but as your mouth numbs, the flavor of the meat chili suace takes over. This dish is down right addictive. I think the key for this "Sweet water noodles" lie in the firmness of the noodles. I like how HongJi Noodle House uses thick firm noodles forcing you to deal with the barrage of spices. I've found that roughly half the ramen shops in Chengdu that have this dish, give it a try and enjoy this numbingly delicious ramen. Located in Chengdu's ChunuXi shopping district, on ChunXi road North section, at the end of the alley near the McDonalds.